Today we learned more about Elisabeth and how her prayers were answered when she found out she was expecting baby John. 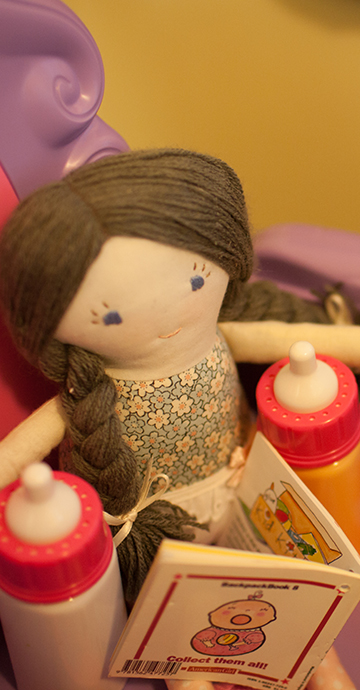 I hid her with some of the girls baby doll items and put her in our little ones booster chair. It was a wonderful lesson on prayer and with it being a busy day it was nice to have a simple craft for us to do. We made a prayer request jar and it has been a practical way to encourage our 4 year old to be praying for others needs and not just her own. I had purchased a dollar store jar, some popsicle sticks, and pom-poms. 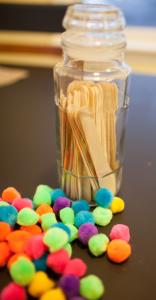 I had planned on having her glue the pom-poms onto the sticks but she liked the idea of just having the pom-poms filling the jar and sticking the prayer sticks into the jar. I wasn’t super set on it being one way or another so we ended up just writing down a few prayer requests and praying for those things that very day. I took a paint marker and wrote “prayer” on the jar and all in all I know it could be cuter but it worked and I think it is a easy craft for anyone. As the weeks have passed and we’ve done different activities it is a joy to see her in her room filling out a stick in no particular order as she doesn’t write yet but telling me what she is “writing” and praying about. Last night it was about her bad dreams, and yesterday her daddy’s work. I am loving this book- the simplicity yet the impact it is having on our kids and our entire family.